The Queen was appointed Colonel of the Grenadier Guards back in 1942, when she was still Princess Elizabeth. As Queen, she is their Colonel-in-Chief, and she has at least two badges she uses in connection with the regiment. The first features a crown over the Royal Cypher mirrored within the blue Royal Garter bearing the words Honi soit qui mal y pense ("Evil be to him who evil thinks," or as it is translated elsewhere on this site, "Shame on he who thinks ill of it" which is also the motto of the Order of the Garter). Today's badges would include The Queen's ER cypher (Elizabeth Regina), though she still wears a badge bearing her father's cypher. 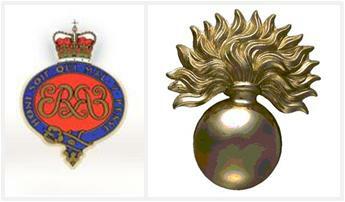 She has also worn the cap badge, which depicts a fired grenade, in brooch form. As with the rest of her regimental badges, these are worn as appropriate when on engagements pertaining to the Grenadier Guards.